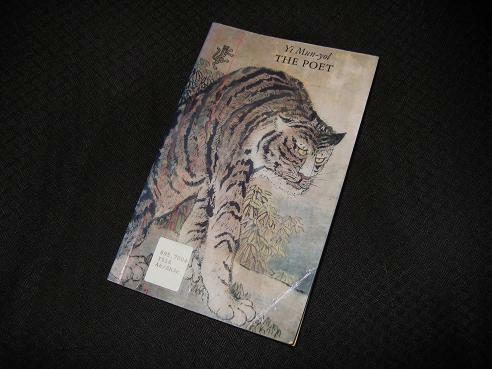 Yi Mun-yol’s The Poet (translated by Chong-wha Chung and Brother Anthony of Taizé) is a short novel looking at the life of nineteenth-century wandering poet Kim Sakkat, a work in which the writer explores Kim’s origins and attempts to work out the truth behind the myths. It’s a blend of fact and fiction, based on a real-life character, an excellent look at what drives those who devote their lives to art and the pressures faced in a society founded on obedience to family and country. The two poor boys are sent off with a loyal retainer to spend years with another of the father’s former servants, and it’s only later that Pyong-yon learns why they’ve been sent away. Their grandfather, an army general, had been executed for treason for aiding a rebellion in the far north of the country, and in a society where treason is punished to the third generation, the boys are in mortal danger. I read several pieces by Yi Mun-yol last year, including some novellas and short stories, and he rarely disappoints, so I was looking forward to this one immensely. It may not sound enticing to many, being a dry retelling of the life of an unknown (to most people) poet; however, it’s actually an intriguing tale, a story which focuses just as much on the causes of Kim’s actions as the actions themselves. We follow the young boy as he grows up, experiencing his successes and failures, watching him develop through various stages until the very end of his life. The younger man, at this time, has not yet developed enough to be able to grasp his companion’s reasoning, but the day will come when he too will understand what poetry really entails. I’m really underread when it comes to Korean literature but this sounds like a very good place to start. What other novel would recommend to a newbie? I enjoyed this, but I found the prose a bit dry; I didn’t get the impression that the translation made a huge difference here. As you say, Yi in this book often seems more of a non-fiction writer than a novelist, and I appreciated The Poet more as an interesting, straightforward work of historical biography than as a literary piece. Some of Yi’s reflections on poetry and society struck me as a bit naive and shallow; unfortunately, I can’t give any examples as I no longer have my copy. I wasn’t aware that the author’s father was a defector; interesting – though I’m not sure knowing it would have deepened my enjoyment in reading the book. Incidentally, I linked your review of Hyun Ki-young’s One Spoon on This Earth in my own review of the same book. I’m glad to see I’m not alone in my thoughts on ‘One Spoon on this Earth’ – I honestly could have written a blog post just listing the bad sentences in that translation… Luckily, a new crop of translators is coming through to join people like the Fultons, so the future is looking brighter. Hopefully, the idea that Korean books *have* to be translated by Koreans (as outsiders are unable to get the cultural nuances…) is a thing of the past. It’s certainly good that more work is being translated, and by more qualified translators. One thing I’d like to see is more translations of pre-20th century literature.